For self-evolution, being critical keeps me motivated to attain goals by adhering to discipline, experience, and action by my constantly questioning and maintaining a willingness to change if necessary. In regards to family and friends, my being critical keeps them and myself on our toes, and helps us to push through obstacles. It is my duty to be positively and honestly critical for the purpose of maintaining harmony and growth. Lastly, being critical of my environment keeps me authentic in my belief system, but only if that criticism is based on action -- 'walking my walk and talking my talk.' Otherwise, being critical is a total waste of time for all concerned. Boundaries are important, whether they are fences around property, or emotional or spiritual boundaries. Boundaries can keep the dogs in, the coyotes out, and keep the societal vultures at bay. I don't put NO TRESPASSING signs up in my world, because that could keep out lessons and surprises. I feel rooted in what i know and own, but I never feel safe. Safety is an illusion! Lucidity is an elusive thing-- a temporal achievement at best, felt only in the moment. Lucidity is ever-present in dreamtime, but when I let go of the moment when I am awake, lucidity escapes me. To maintain lucidity in my waking life is one of my many daily tasks. Balance is a state of being, a journey, not a destination or point of arrival- it must be attempted on a daily basis. Like the minutes in an hour, like the clouds in the sky, and like the breeze in the ever-moving winds, balance is a state of mind, matter, and spirit operating together in the ever-changing moment. When dreams manifest in my waking experience of life, then I am truly living. If I dream that I am walking in a garden, and all is perfect and sublime, and then I find myself awake and walking in a garden, all is, again, perfect and sublime. The dream made manifest in this waking world is the elusive reality of life in this moment, taking the time to smell the proverbial roses. In German, this person is called a Lebenskuenstler, an artist of life. Meditation is an active choice, a technique to become one with a reality that is both visible and invisible -- one that is seen and felt, and one that is not seen and felt. It is the breeze of cool air on a hot day under the shade of a peach tree, with magpies chatting away noisily, horses whinnying, and bees buzzing. It is no sound, no mind, and emptiness. I meditate to be part of existence, to be part of everything, and to be part of nothing. Family and love are close to my heart - always felt, always present. The family that we are born into is our chosen karma, the place where we learn the most important lessons we carry throughout our life. Our bond is a genetic tie of shared karma that is passed on and on. We have a responsibility to help one another change that karma or to continue passing it on. Then we have our chosen family of people who are not our blood family, but whom we also have karma with. Some of these people are present for our entire lives, some for a short time, and others for just a moment. We find others in this lifetime to support us in further transformation and to help us in realizing our authenticity. Finally, there is the family of ultimate choice - there to create progeny and pass on the genetic codes of our existence as we work through our spirit journey. This is the sacred union with our chosen partner. I believe that genetic love gives rise to social/cultural love, which creates inner passionate and sacred love. Therefore, all children are pure love. Money is a curious matter. Coming from an experience of having little money when growing up and having to work for it - there were no handouts in my life whatsoever - I place a value on money. Money is to be spent, enjoyed and shared. Money is energy-manifested and must be kept circulated, not hoarded. Money can be liberating if used wisely. But money can become a prison if not used properly, creating greed and a spiritual vacuum in the self and then, unhappiness will definitely ensue. I have horses, dogs and cats around me. 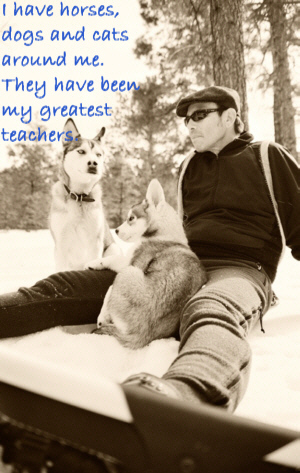 They have been my greatest teachers. The way they surrender to the moment is a quality worth acquiring. The way they show me their omnipotence, their unconditional love, and the way they are in the moment -- you can see that they are not missing out on anything at all. Just ask them. They might tell you... or not. This moment is perfect, just as it should be, right NOW!